The WorkCast Platform is a unique webinar and webcasting platform which grants specific levels of control and interaction to a selection of different user types. This ultimately reduces the risk of events being misconfigured. Users specifically involved in the administration of the platform, users and the creation, management and administration of events and templates. Typically not presenters or contributors of the specific event content. Users coordinating department or organization’s webinar and online event activities. A Producer user is included with a Producer+ licence. They are able to create, edit and run all events in an account. 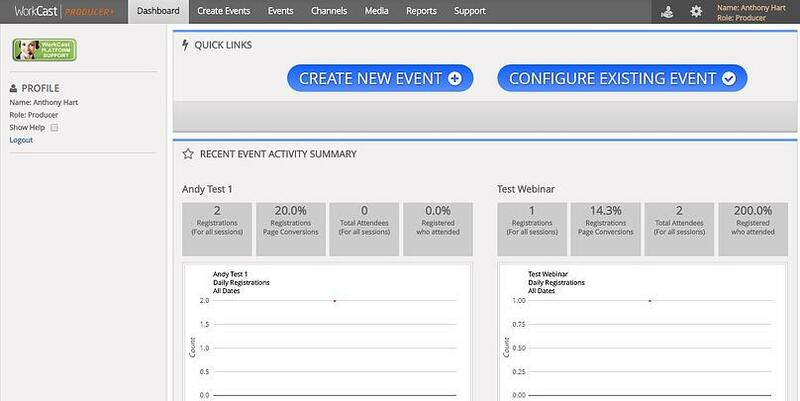 Event creation is completed using the Master Event templates created by WorkCast at the point of account provision. This role has access to a wide range of features which allow managing and running a range of event types and configurations (with the exception of self-service live streaming from venues). Host users are able to see and manage the content and scheduling of all events created within the account. Host users are available to Enterprise, Producer+ and Present+ customers. 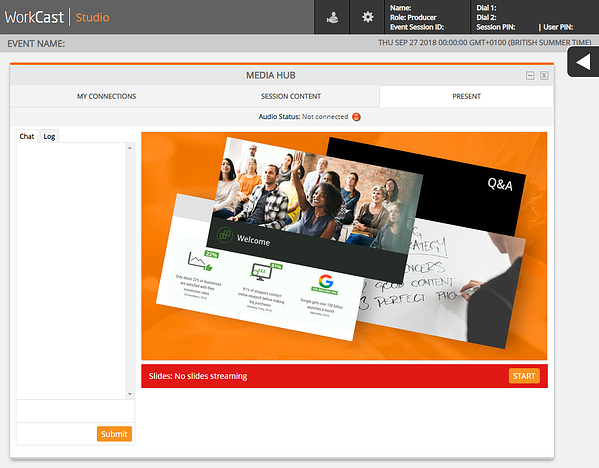 Host users' view and controls are specifically designed to make it easy to create and manage webinars from either standard or custom Master Templates. There are 2 different types of host users. When you purchase your licence with us, your host user profile has account-wide characteristics meaning you can manage your full account in the areas above. The second Host profile available for purchase is a personal host user. This profile is available to purchase additionally and limits the view to only events/managing content created by that particular user. The personal host profile cannot see or edit/manage events created by another user unless they are given presenter access to specific events. Account-wide host users can see anything created by personal host users. The personal host user profile is generally used for businesses with other departments who need to create/run webinars but are separate to the overall webinar program. Please note: Present+ licences can run 1 webinar at 1 time - please take this into account. There are 2 additional roles in the platform which are related to event specific functions. The Presenter role is specifically designed for event presenters to login to the webinar/session they have been allocated to present on. Presenter logins can be created by either Producer or Host users and can be emailed their unique login to the WorkCast Studio. This email is sent via the 'Email Presenters' button within the Event Experience tab. 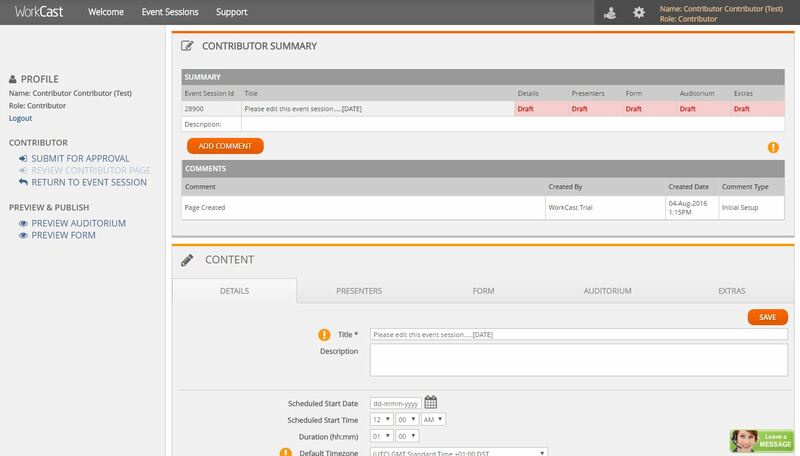 The Contributor role is specifically designed for managed event customers to add their event-specific information into pages. 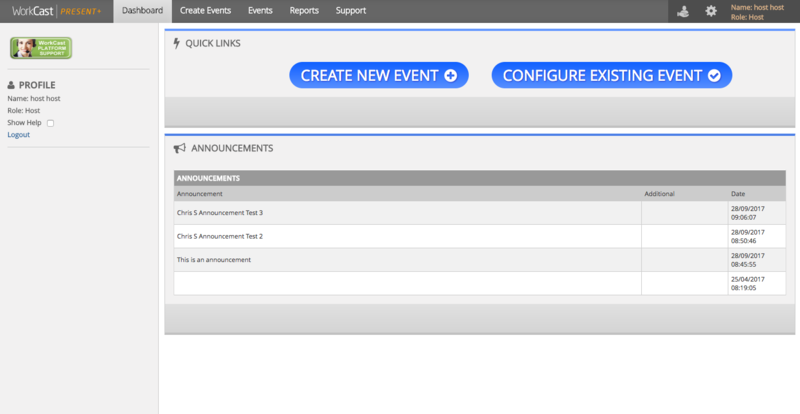 WorkCast would provide login and access details to the specific event. The user can then login and add information at their convenience. Managed events are available to purchase through your sales person or account manager who will also be available to discuss this further.